The Liberty House founder has made the bold claim that Port Talbot steelworks could be saved with all jobs intact. He hasn’t yet donned a cape and tights, but Sanjeev Gupta is very much gunning to be Tata Steel’s superhero. The Liberty House founder, son of one of India's richest men, has emerged as a potential buyer for the steelmaker’s embattled British operations, including Port Talbot and has met with the government to discuss his plans. In a situation as tricky as this, you’d probably want to err on the side of caution when it comes to making grandiose statements about what is and isn’t achievable. So you can only assume Gupta is more than confident about his ambitions to help turnaround Britain’s steel crisis. In an interview with Channel 4 news, the steel tycoon said he believed Tata Steel’s UK business can be rejuvenated – without any job losses at the plant. The business employs 15,000 at Port Talbot and other sites around the country. ‘I will not undertake any project in the UK, including Port Talbot, which would require us to make people to be redundant,’ he said. Stressing it was just based on a first look, Gupta said his initial analysis suggested that the current workforce was ‘efficient and sustainable’. But (there’s always a but), they ‘would need retraining if we’re going to move from blast furnaces to arc furnaces,’ he pointed out, as it involves different processes and needs different skills. Blast furnaces are notoriously labour intensive and burn through energy like nobody’s business, and Gupta's planned move to arc furnaces would also mean ‘operating things on a more flexible basis’. The transition would entail using domestically available scrap rather than imported raw material. It’d also, needless to say, be a pricey move and there's the question of who would foot the bill. 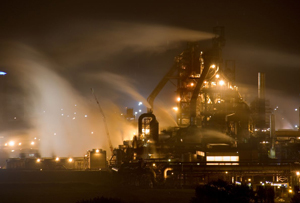 Taking on Port Talbot would be a dramatic move for Gupta, whose company is a minnow compared to the likes of Tata. He’s clearly confident Liberty has the know-how to help British steel and provide the best solution. But until a deal is inked, Port Talbot workers will be steeling themselves for the worst.